Peter Hayes is a professor of history and Theodore Zev Weiss Holocaust Educational Foundation Professor of Holocaust Studies at Northwestern University. He is the author of From Cooperation to Complicity: Degussa in the Third Reich and Industry and Ideology: IG Farben in the Nazi Era. Harvey Schulweis is chairman of The Jewish Foundation for the Righteous. As the Holocaust passes out of living memory, future generations will no longer come face-to-face with Holocaust survivors. But the lessons of that terrible period in history are too important to let slip past. 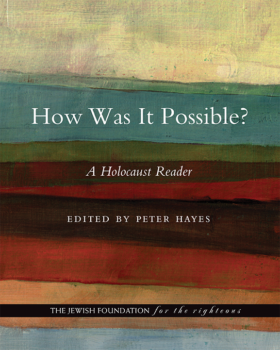 How Was It Possible?, edited and introduced by Peter Hayes, provides teachers and students with a comprehensive resource about the Nazi persecution of Jews. Deliberately resisting the reflexive urge to dismiss the topic as too horrible to be understood intellectually or emotionally, the anthology sets out to provide answers to questions that may otherwise defy comprehension. This anthology is organized around key issues of the Holocaust, from the historical context for antisemitism to the impediments to escaping Nazi Germany, and from the logistics of the death camps and the carrying out of genocide to the subsequent struggles of the displaced survivors in the aftermath. Prepared in cooperation with the Jewish Foundation for the Righteous, this anthology includes contributions from such luminaries as Jean Ancel, Saul Friedlander, Tony Judt, Alan Kraut, Primo Levi, Robert Proctor, Richard Rhodes, Timothy Snyder, and Susan Zuccotti. Taken together, the selections make the ineffable fathomable and demystify the barbarism underlying the tragedy, inviting readers to learn precisely how the Holocaust was, in fact, possible. This book is available through the University of Nebraska Press. We have arranged for supporters of The Jewish Foundation for the Righteous to receive a 20% discount* on the cost of the book.